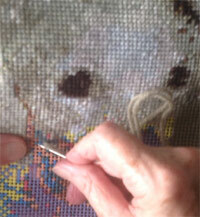 Dispatched within 3 to 5 working days of approval of the tapestry template. 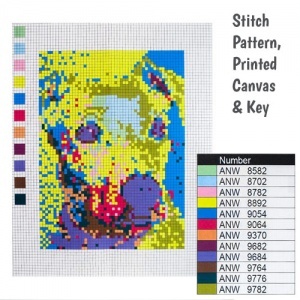 These unique tapestry kits allow you to easily create a tapestry of your very own dog or to give as a wonderful and original gift for a dog loving friend. 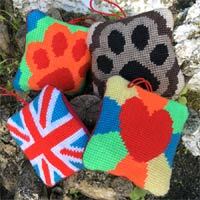 The perfect gift for yourself or a dog loving friend. A lovely talking point and so relaxing to create. 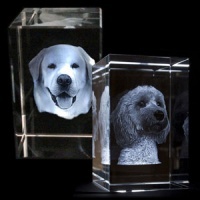 All you have to do is upload your dog's photo when you order and let the team do the rest. 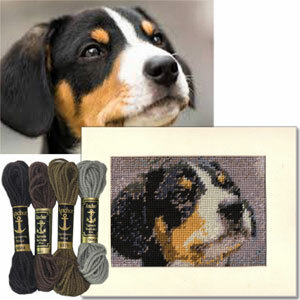 They will create the tapestry pattern, which you get to approve before the kit is made. Choose from a small 5 x 7 inch printed canvas for one pet or a larger 8 x 10 inch or 10 x 10 inch canvas for two pets or people. Your kit arrives completely ready to make with a printed canvas clearly showing which colour to stitch where and all the tapestry wools you will need, in the colours your particular tapestry requires. 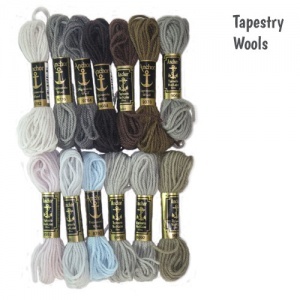 All thread is 100% Anchor tapestry wool. 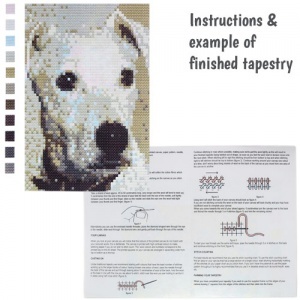 Also included are full instructions and even an image of how the completed tapestry will look, so anyone can get started with ease. So simple to do, so satisfying to complete and so beautiful, you can treasure it forever. 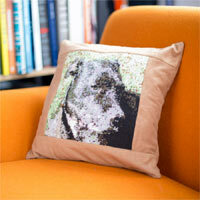 Each tapestry is digitalised in up to 15 different colours for high quality finish. A clear head shot or upper body shot is recommended. Good colour and contrast on a simple contrasting background also produces the best results. The simpler the background the more detail you will have of your subject. 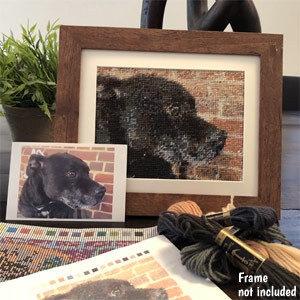 Please note that your photo will be cropped as necessary to produce the best detail and therefore tapestry result. You will be emailed a proof for your approval. This was created and posted out so quickly and I was thrilled with the design and contents. I worked on my tapesrty of my puppy for just over a week before it was completed and then I had it framed! It was well worth the money and I am so proud of my 'art work'! 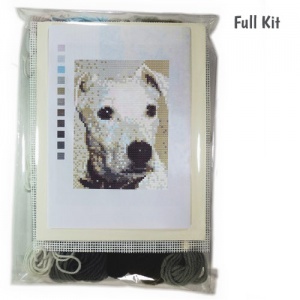 I plan to purchase this kit annually so I can record my little dogs growth in stitch! The kit is good - ideal for a beginner. Especially like how all the exact wools are provided. BUT - the print on the canvas is too near the edge and it is fraying badly, I am in danger of it fraying into the tapestry print, even though I have attempted various ways to stop the fraying. Hi Cheryl, thank you for your review. The edges should not fray or be too close to put the tapestry in any danger. I made one of these myself last year and certainly had no issue with fraying. Please email us a photo if you are worried and I will be happy to take a look.